Khabib Nurmagomedov isn’t ready to commit to the number of fights he has left in his career or even who he may face next in the UFC but there’s one opponent that still sticks in his mind as someone he hopes to face before calling it a career. The undefeated Russian has long considered Georges St-Pierre as a fighter he not only respects but somebody that would be a huge addition to his resume as he looks at the legacy he hopes to leave behind when fighting is finished. St-Pierre is a former two-division UFC champion, the longest reigning welterweight champion in company history and arguably considered one of the greatest mixed martial artists of all time. Add to that, St-Pierre has teased that he’d be open to challenging for a third world title if the UFC would allow him to go down to lightweight, which would mean he’d be on a collision course to face Nurmagomedov should that ever happen. “Georges St-Pierre is a very big name. 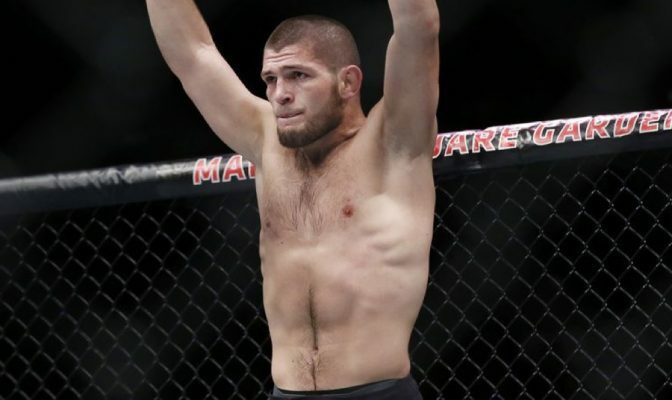 I like, an opponent who is a very tough opponent and he’s a little bit bigger than me,” Nurmagomedov told Submission Radio when speaking about the Canadian legend. “And if we’re gonna fight, we have to fight at 155 [pounds], because 170 [pounds] is his weight and he’s gonna be a little bit bigger than me. And for me it’s like a smart decision taking him to 155. St-Pierre hasn’t yet committed to another fight in the UFC, although he remains under contract with the promotion. UFC president Dana White has said he doesn’t expect St-Pierre to fight again any time soon if ever again but he repeated those same predictions ahead of his return in 2017 when he defeated Michael Bisping to become middleweight champion. If the fight ever came together, Nurmagomedov vs. St-Pierre would obviously be a massive event for the UFC but there’s no telling if it would ever happen. For his part, Nurmagomedov can’t be sure it would ever come together but he definitely ranks St-Pierre as one of the three opponents he believes he would have to face to cement his legacy as the greatest of all time.